Arizona State University’s Fall Welcome ceremony in August 2018 included more than 3,000 freshmen being welcomed to the Ira A. Fulton Schools of Engineering, which have generated 96 patents and 17 startups in the past three years. The 2017 CompTIA Cyberstates Report showed that the average tech wage of almost $98,000 was nearly double the $49,500 average annual salary of the Phoenix metro region, and $20,000 more than the average tech wage across the entire state. Is that stopping the industry from creating more jobs? Hardly. Computing power and brainpower are a powerful one-two punch. The Arizona Technology Council Industry Impact Report released in June 2018 revealed 1.38 percent employment growth in the sector, second in the Southwest and ahead of California. The report also showed a growing technology workforce of 168,211 jobs, "more than 8,000 technology companies operating in the state, a pattern of innovation and an engagement of diverse stakeholders." Recent council initiatives have included the recapitalization of the Angel Investment Tax Credit, the extension and continued expansion of the R&D Tax Credit program until 2021, and the opposition to laws that may prohibit members' employees — local and foreign — from working safely in Arizona. Arizona's technology industry contributed more than $32.5 million in total taxes in 2016. There are 2,156 startups in Arizona listed on AngelList. The average Arizona technology startup valuation is $3.9 million. There were 2,741 patents awarded in Arizona in 2015. "Arizona is well positioned to claim its place in the national playing field of competitive technology markets," said Steven G. Zylstra, the Council's president and CEO. Computer systems design, semiconductor manufacturing, and aerospace product and parts manufacturing represent roughly half of the annual wage totals in the state of Arizona — and many of those wages are being earned in Greater Phoenix. According to CompTIA, the metro area saw a net gain in tech jobs of 3,660 between 2016 and 2017, with nearly 50,000 tech occupation job postings in 2017, and nearly 30 percent growth in "emerging tech" job postings. As recently as 2016, the Greater Phoenix Economic Council and semiconductor industry consortium SEMI produced a report on the microelectronics cluster that first bloomed there 60 years ago with the arrival of Motorola and has gone on to become, as the report puts it, the region's core technology driver. "Motorola and other companies were lured by the proximity to California, the favorable weather, low land cost, and as part of a national defense strategy," said the report, noting the arrival of big names that became Lockheed Martin and Honeywell. Those big players not only helped build engineering curriculum at the University of Arizona in Tucson, but were the guiding lights in the creation of Arizona State University and its professional engineering school. ASU welcomed 109,000 students onto campus and online in August 2018, including a freshman class of 13,000 that represented a 12 percent jump from the year before. The students matriculating from campus to the job market today know that the days of the corporate electronics giant have evolved to something entirely different and, to many, more promising: an industry ecosystem built of small and medium-sized companies and startups. As the GPEC/SEMI report noted in 2016, by 2013 only eight microelectronics firms in the region had more than 1,000 employees. Meanwhile, employment at companies with fewer than 50 employees grew by 45 percent between 1990 and 2013, while employment at large firms shrank by 34 percent. Those trends only continue, meaning an increasingly rich cluster that not only serves the big companies' supply chain needs, but branches off into other, complementary areas, including software. The area is home to 5,678 tech business establishments. The biggest of the big, Intel in 2017 announced plans to invest more than $7 billion to complete Fab 42, the most advanced semiconductor factory in the world. The factory in Chandler will directly create nearly 3,000 high-tech, high-wage jobs, and is expected to indirectly support more than 10,000 long-term jobs in Arizona. The complex will produce microprocessors to power data centers (see sidebar) and hundreds of millions of smart and connected devices worldwide. Foreign Trade Zones (FTZs) are often thought of as low-tech places to hold goods. But in Greater Phoenix, they play a crucial role in the success of Honeywell International, the region's second-largest employwer after Intel. The company operates four sites in FTZ No. 75 that, thanks to the program's alternative site framework option, sit in Deer Valley, Tempe and Phoenix Sky Harbor International Airport (home to Honeywell Aerospace Global Headquarters). A fifth site may be added soon, once a minor boundary modification process in the FTZ is complete. The four sites employ close to 7,000 people in Phoenix and Tempe at an average wage of $96,300, which is 173 percent higher than the county median wage. The four Honeywell sites in the FTZ create an annual economic impact of $3.41 billion in Maricopa County. The company's operations directly and indirectly support an approximately 13,969 jobs and generate $1.03 billion in annual personal income in the county. In 2015, Honeywell spent an estimated $183.3 million with Maricopa County-based vendors, supporting an estimated 1,666 additional jobs and $102.4 million in payroll at local vendor businesses. Anybody with cable knows Cox, which two years ago moved into expanded space at Blackhawk Corporate Center in the hot Deer Valley submarket. Among approximately 20,000 Cox employees nationwide serving more than 6 million residences and businesses in 18 states, 3,200 (16 percent) are in Arizona. The company is doing its part for the entire metro's tech infrastructure too, activating thousands of wifi hotspots in the same metro area where it chose to launch its first market-wide gigabit internet service (offering Greater Phoenix customers speeds 100 times faster than average). 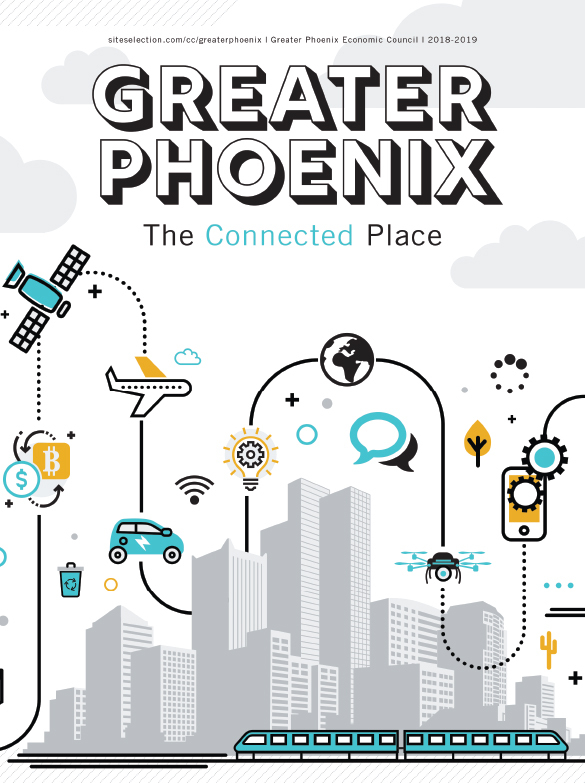 Phoenix in 2016 was among 16 "Smart Gigabit Communities" nationwide that, alongside 55 research universities, are working as living labs of testbeds for smart gigabit applications. 2017 was the big moving year for this company, a microelectronics engineering and manufacturing firm that announced plans to relocate headquarters to Tempe from Texas and add approximately 500 new jobs in Greater Phoenix. "Microsoft, Amazon, GoDaddy and now Benchmark have all found a home here in Tempe," said Tempe Mayor Mark Mitchell. The firm broke ground for the new HQ in November 2017. Among those present were Doug Ducey, Arizona Governor; Paul Tufano, Benchmark President and CEO; and Sethuraman Panchanathan, executive vice president, Knowledge Enterprise Development and chief research and innovation officer at Arizona State University. "With the groundbreaking of Benchmark's new headquarters and 500 new jobs headed our way, eyes from New York City to Silicon Valley are once again focused on our state," Ducey said. "Benchmark's selection of our state is further proof there is no better place than Arizona to start or scale a business, or test and develop new technology." The company has already joined forces with Arizona State University through a strategic partnership to foster an innovative ecosystem that benefits students and businesses. Benchmark plans to leverage the impressive talent produced by ASU's Ira A. Fulton School of Engineering and W. P. Carey School of Business in its hiring efforts. "Our partnership with Benchmark is another step toward the outstanding collaboration between business and education we have fostered at our university," said ASU President Dr. Michael Crow. Construction is expected to be completed in early 2019. The new HQ will house the corporate leadership team and key corporate functions. Benchmark's Internet of Things (IoT) Center of Innovation will also transition to the new location. Greater Phoenix had net data center absorption of 32.5 megawatts during the year’s first half, with 61.4 megawatts of space under construction.